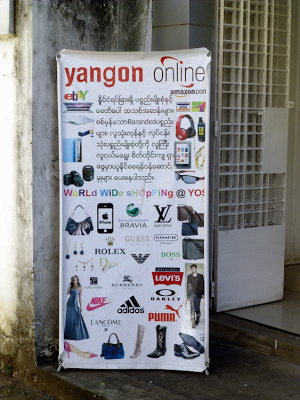 Last week, I spent a couple of days in Yangon, the largest city in Myanmar. Here are some quick impressions of the state of the Internet there. 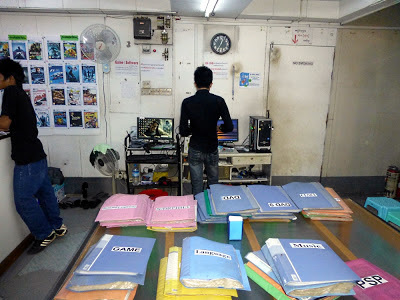 I stopped at two Internet cafes to check email and upload my student's final grades. The computers were old tower PCs with small LCD displays, and they were running Windows 7. The cost was only 50 cents (US) per hour, but the connections were slow -- around 100 kbps as measured by Speedtest.net. At that speed, I was able to read my email, but our campus grade reporting system was unusable. 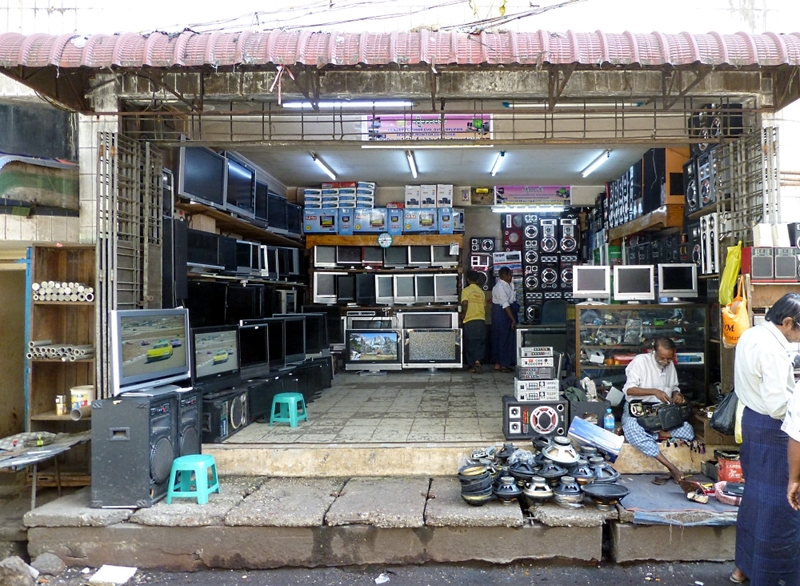 As in many developing nations, pirated software is sold openly in Myanmar. 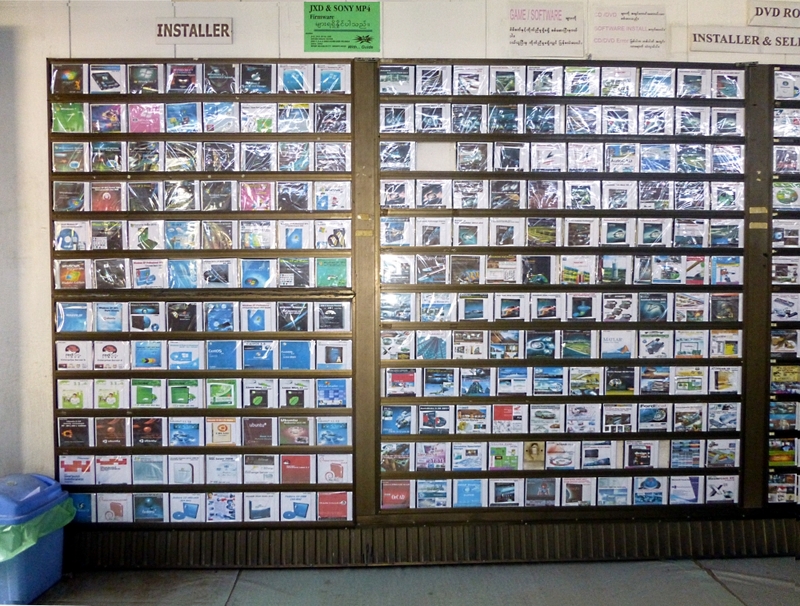 The labels on the binders shown below indicate the categories of software for sale in a store I visited. (You can see the "production department" against the wall behind the table). 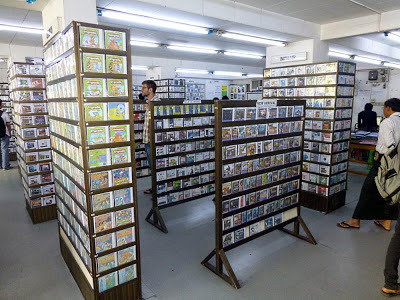 Disks were also displayed on racks in the store. 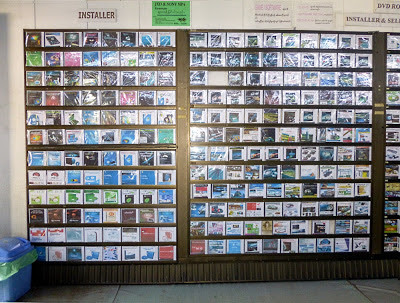 "Installers" -- disks with programs -- cost $US 1.25 and content disks cost just over 50 cents. 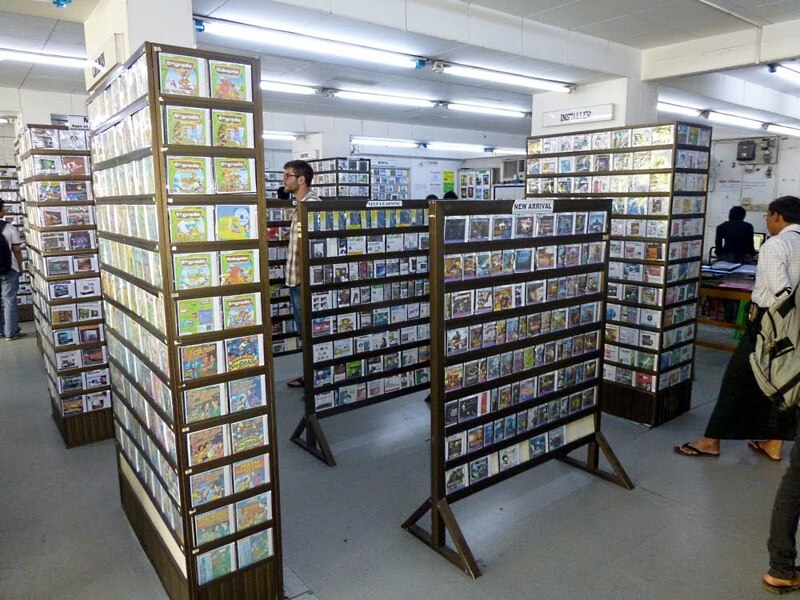 The selection was quite random and many of the programs were old versions. Windows 7 was available, but not Windows 8. 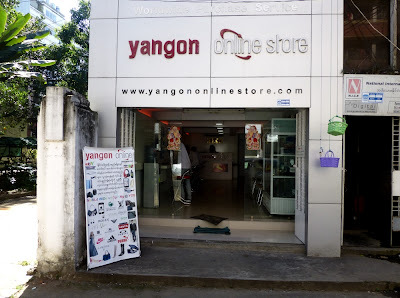 One of the newest looking shops I saw had computers customers used to make online purchases. This service makes sense in a nation where few people have Internet access and payment and delivery systems are not available. Finally, I saw a shop selling used consumer electronics and computers. They also had a smattering of electronic parts -- it reminded me a little of the computer and component swap meets back in the early computer hobby days when we were wire-wrapping our own boards and of the auto junk yards where I hung out as a kid. As we see, a very small percent of the population uses the Internet and there is no mobile access. Organization use, as measured by .mm domain names and secure Internet servers, is practically non-existent. The International Telecommunication Union (ITU) ranks Myanmar 131st out of 155 nations using its comprehensive ICT Development Index. (The only Asian nation below Myanmar is Nepal, which is ranked 137th). 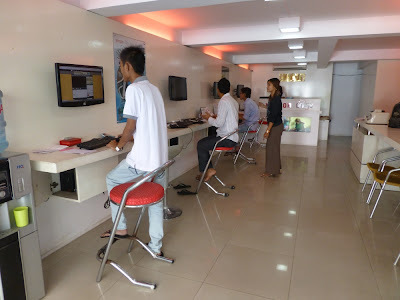 These statistics explain why my connectivity at Internet cafes in the largest city in the nation was so slow. That is the bad news. The good news is that Myanmar is rich in natural resources and seems to be emerging from a repressive, capricious and corrupt military dictatorship that dates back to 1962. In 2011, they released Nobel Peace Prize winner Aung San Suu Kyi from house arrest and held elections for a minority portion of the Parliament seats. Aung San Suu Kyi's party, the National League for Democracy, won 43 of 45 seats available in the election, and general elections will hopefully be held by 2014. In recognition of these changes, both Secretary of State Clinton and President Obama have visited Myanmar. Let's hope this apparent progress is for real and the Internet and the nation develop rapidly. I teach in the "smart" classroom shown here. 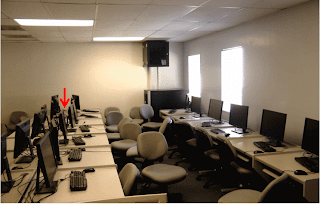 The students sit at computers and the professor has a podium computer. I use the overhead display during every minute of every class -- for presentations and live demonstrations of all sorts of things. Yesterday morning, I walked into the classroom and discovered that the overhead display was broken, so we had to improvise. I sat down at one of the student computers in the middle of a row (the one with the arrow) and the students crammed in behind me -- sitting on chairs, tables and standing. All of my teaching material is online, so I was able to use the exact same PowerPoint decks and do the exact same demonstrations as I would have used from the podium if the projector had been working. The material was 100% the same -- only the seating arrangement changed. I don't know whether you can picture the scene, but it was cramped and disorderly. (I wish I had taken a picture). Why am I telling you this? I have been teaching on and off during my entire career, and it was one of the best class sessions I can remember. I taught a second section of the same class yesterday evening in the same room. The projector worked fine for about half an hour, then broke again. We crammed in behind the student computer and continued. The class lit up. Students listened, spoke, answered questions I threw out, asked a lot of good questions, made relevant comments and wisecracked and teased. It was even better than the morning class. I was able to do this because my classes are small. A few students were too far from my screen to see it comfortably, so they turned on a couple of computers in the same row and navigated along with me. (We could have automated that by starting up a Google Hangout and sharing screens). The success of our re-arranged room would not have surprised Michael Wesch, an award winning professor of anthropology who has long noted the impact of room design on teaching. (For a taste of his thoughts on the topic, watch this 3m 46s excerpt I cut from a talk he gave upon receiving an outstanding teaching award). I'm no anthropologist, but these class sessions felt better than a small seminar around a conference table. The ad-hoc seating arrangement turned the classes into focused bull sessions by breaking down social barriers between the students and me and, more important, between themselves. The success of this small, ad hoc arrangement is ironic, because it comes at a time when I have been writing about massive open online classes, MOOCS, and have proposed teaching one. MOOCs have the potential to be extremely cost efficient, but my small class gathered around a PC was extremely costly -- the California taxpayers would not sustain it and the students would get tired of standing up after a while. Could we capture some of the enthusiasm and interaction of the live class I had yesterday and share it with a mass audience taking a MOOC at the same time? Maybe. 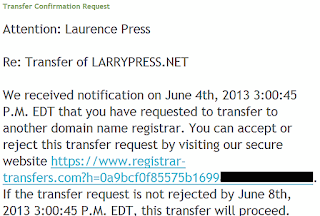 Last year, I registered the domain larrypress.net with Network Solutions (NS). I had no immediate use for the name, so I opted for automatic renewal and forgot about it. 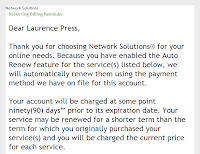 On September 28, 2012, I received an email from NS saying they would automatically renew the registration some time in the next 90 days. (I checked later -- the expiration date was January 12, 2013). Some time later, I remembered the pending expiration, and renewed. My credit card company notifies me of online charges, and I received an email saying NS had charged $37.99. That struck me as mistakenly high, so I tried to stop the transaction using email. I could not figure out a way to do that on their Web site, so I called and spoke to a customer representative. I told her that the price was too high, so I wanted to drop the registration. She said she really did not want to lose me as a customer and asked what prices I had gotten from other registrars. When I hedged the answer, she said she would only charge me $9.75. Sleazy. Being busy, I said OK, but it turned out that she could not authorize the credit card adjustment and transferred me to another woman who said she would adjust the credit card charge. 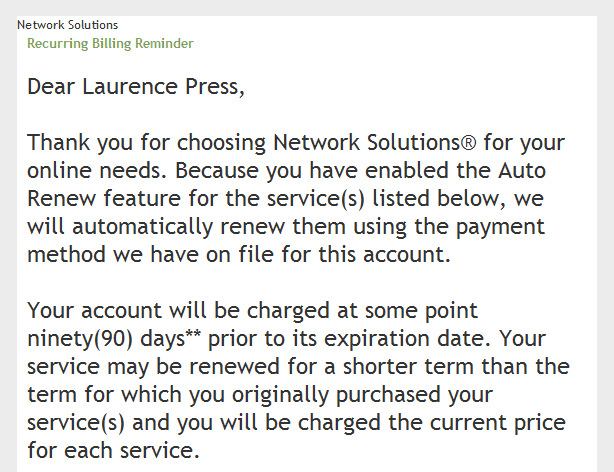 I said great, but that I no longer wanted to auto renew. She offered to cancel my auto renew option, but needed answers to my three security questions in order to do that. Great, but, since the answer to two of my questions was the same (my first school and my sixth grade school), I would have to log in and change my security questions first. I asked if I couldn't just log in and drop auto-renew by myself. It turns out that you cannot do that yourself -- you have to call them and have them do it for you. I logged in, changed my security questions and she turned off auto renewal. Total elapsed time on the phone -- 38 minutes. This moves NS into second place in my race for King of Sleaze, but Verizon remains on top (http://bit.ly/RuoWhT). 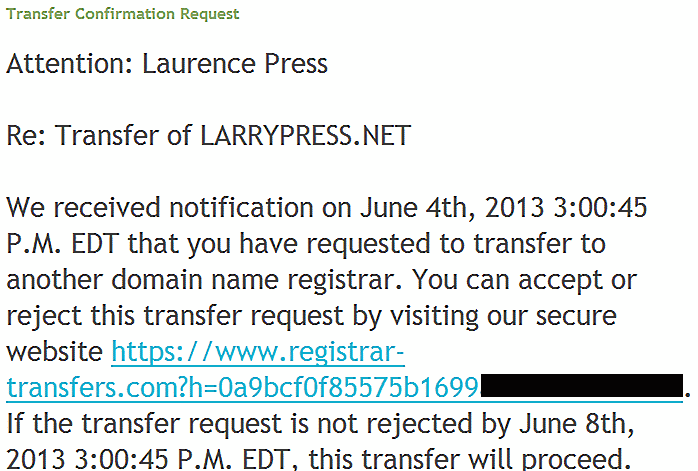 After the above experience, I wanted to move the domain to another registrar. Hover.com pitches themselves as ethical and straight forward, so I went to their Web site to make the switch. They informed me that the domain was "locked" -- an odd concept. I surfed over to the Network Solutions Web site, where I learned that one cannot unlock a domain using their account manager -- you have to call them and speak to a representative. So I called. After a few menu choices, I was put on hold, but after 3 minutes and 36 seconds the connection hung up. I called back, went through the menus and reached an operator who grilled me on security questions and account details, then asked why I was transferring the registration. When I told her why, she offered to let me keep the domain for $9.95 per year. I asked if that would be "forever," and she said "yes." I told her that Hover charged $15 per year, and that for $5 per year, I would rather deal with an ethical, straightforward company and wanted to go ahead with the transfer anyway. She allowed as how unlocking the domain would take at least 24 hours, which seemed goofy, but it turned out that the unlocking was done a minute later -- I guess they were hoping I would reconsider if I waited 24 hours to check. What marketing genius invents these procedures?